Intel Optane DC Persistent Memory is an innovative technology that delivers a unique combination of affordable large memory capacity and persistence (non-volatility). The persistent memory technology can help boost the performance of data-intensive applications, such as in-memory analytics, databases, content delivery networks, and high performance computing (HPC), as well as deliver consistent service levels at scale with higher virtual machine and container density. This product guide describes the Data Center Persistent Memory Modules (DCPMMs) and provides essential pre-sales information to understand the memory modules, their key features and specifications, and compatibility. This guide is intended for technical specialists, sales specialists, sales engineers, and IT architects who want to learn more about the DCPMMs and consider their use in IT solutions. Using Lenovo ThinkSystem servers running applications that are tuned for Intel Optane DC Persistent Memory will result in lower data latency compared to solid-state drive technology. When data is stored closer to the processor on nonvolatile media, applications can see significant overall improvement in performance. An Intel Optane DC Persistent Memory Module (DCPMM) is shown in the following figure. Intel Optane DC Persistent Memory modules (DCPMMs) have the form factor of a DDR4 DIMM, but the persistence and capacity of data storage of a solid-state drive. This means the DCPMMs have performance characteristics similar to that of TruDDR4 DIMMs, the storage capacity of an SSD, and the ability to stay active after a power cycle or reboot of the server. These features open up a new way of performing data I/O to application developers and new levels of server performance to customers. The following table lists the ordering information for the persistent memory options. In this mode, the DCPMMs act as large capacity DDR4 memory modules. In such a configuration, the memory that the operating system recognizes is the DCPMMs; the installed TruDDR4 DIMMs are hidden from the operating system and act as a caching layer for the DCPMMs. In this mode, the persistence feature of the DCPMMs is disabled. This mode does not require the application to be DCPMM-aware. In this mode, the DCPMMs provide all persistence features to the operating system and applications that support them. The operating system presents both TruDDR4 DIMMs and DCPMMs to the applications, as system memory and persistent storage respectively. Direct access (DAX): byte-addressable storage accessible via an API. The applications must be DCPMM-aware and use the published APIs to implement the DCPMM features. Block storage: the persistent memory is presented to applications is seen as a block storage device, similar to an SSD. The operating system needs to be DCPMM-aware, however the applications do not. Mixed Memory Mode is a combination of Memory Mode and App Direct Mode, where a portion of the capacity of the DCPMMs is used for the Memory Mode operations, and the remaining capacity of the DCPMMs is used for the App Direct Mode operations. In this mode, all installed TruDDR4 DIMMs are hidden from the operating system and act as a caching layer for portion of the DCPMMs in Memory Mode. Interleaved, where all DCPMMs are seen as one single monolithic space. This is similar in concept to RAID-0 in storage. Non-interleaved, where each DCPMM is seen as a separate space. This is similar in concept to JBOD in storage. For configure-to-order (CTO) configurations, the feature codes listed in the following table specify the DCPMM mode you wish to enable. 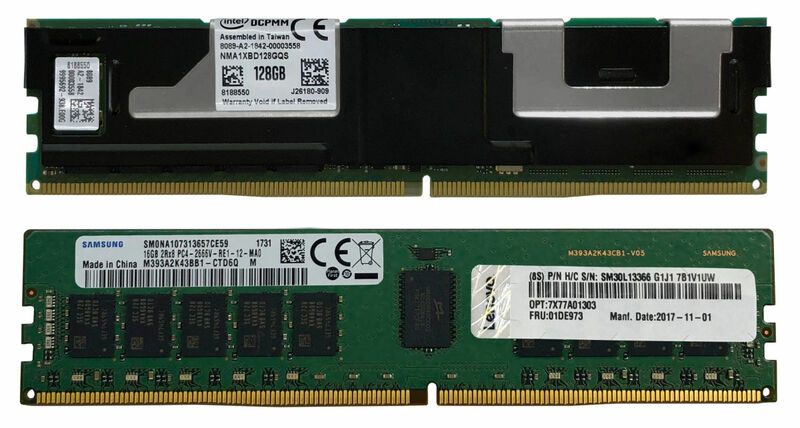 The following figure shows a Lenovo TruDDR4 DIMM and an Intel Optane DC Persistent Memory Module. Larger memory footprint: For applications with performance characteristics that place greater emphasis on memory capacity over memory bandwidth or memory latency, the use of DCPMMs can mean a significant increase in memory performance compared to the use of TruDDR4 DIMMs. In-memory databases: With DCPMMs, database applications have store much larger databases in persistent memory rather than on disk, and database performance will be improved significantly. For existing applications that use system RAM for in-memory databases, the use of persistent memory will mean no delays at boot time having to copy the databases from disk into memory. Storage caching layers: TruDDR4 DIMMs can be used for the fastest memory access - best throughput and lowest latency, and DCPMMs can be used for the caching layer that offers memory-like performance with the persistence of SSD storage. NFV infrastructure: Network Function Virtualization (NFV) can make use of increased memory capacity and performance with the addition of DCPMMs. 2666 MHz memory bus speed. Any 2933 MHz TruDDR4 DIMMs installed will also operate at 2666 MHz. In the App Direct mode, the DCPMMs also support memory mirroring that is performed by the processor's integrated memory controllers. Memory mirroring is not supported in Memory Mode or Mixed Mode. Memory rank sparing is not supported by DCPMMs in any mode. DCPMMs require second generation Intel Xeon Scalable Family processors. First generation Xeon Scalable processors are not supported. All Platinum processors, all Gold processors and the Silver 4215 processor support DCPMM. The use of 1Rx8 DIMMs with DCPMMs is not supported. See the Memory DIMM support section for specifics. When either Memory Mode or Mixed Mode is used, the ratio of memory to DCPMMs must be between 1:16 and 1:4, and the recommended ratio is 1:4 for the best performance. For example, 6x 16GB DIMMs + 2x 256GB DCPMMs is a ratio of 1:5.33. In Mixed Mode, the ratio is between memory and only the volatile portion of the DCPMMs. This ratio requirement does not apply to App Direct mode. The following figure shows DCPMMs and TruDDR4 DIMMs installed in the system board of a ThinkSystem SR950. In this full configuration, there is one DCPMM and one TruDDR4 DIMM installed in each memory channel (6 DCPMMs and 6 DIMMs per processor). DCPMMs are only supported in quantities of 1, 2, 4 and 6 per processor, and only certain quantities of memory DIMMs are supported alongside the DCPMMs. The following table lists the supported combinations in App Direct mode. In Memory Mode, the DCPMMs are seen by the operating system as system memory. The memory DIMMs are hidden from the operating system and are used as a high-speed cache for the DCPMMs. 1:16 means 1GB of DIMMs (used for cache) for every 16GB of DCPMM capacity (used as system memory). A larger number than 16 means potentially worse performance since the chances of a cache hit in memory will be lower. 1:4 means 1GB of DIMMs for every 4GB of DCPMM capacity. 1:4 is recommended as the best trade-off between performance and cost. A number smaller than 4 means system memory may be underutilized as cache and not worth the expense of the DIMMs. The specific memory part numbers that are supported with DCPMMs is listed in the Memory DIMM support section. The table below shows sample combinations and the effective ratio. You can use this table as guidance to determine DIMM and DCPMM sizes based on desired total system memory capacity (which is the total DCPMMs when in memory mode) and the desired ratio. When all 12 DIMMs are installed, this is referred to as a "2-2-2" configuration, where each 2 corresponds to the number of DIMMs per channel in one memory controller. When fewer DIMMs are installed, it is referred to a "2-2-1" or "2-1-1" or similar. Balanced memory configurations: For more information about the recommended placement of memory in ThinkSystem servers, see the paper, Balanced Memory Configurations with Second-Generation Intel Xeon Scalable Processors. Mixed Memory Mode is a combination of Memory Mode and App Direct Mode, where a portion of the capacity of the DCPMMs is used for the Memory Mode operations, and the remaining capacity of the DCPMMs is used for the App Direct Mode operations. In Mixed Mode, all installed TruDDR4 DIMMs are hidden from the operating system and act as a caching layer for portion of the DCPMMs in Memory Mode. Like Memory Mode, the ratio of total of the memory DIMMs to the total of the volatile (memory) portion of DCPMMs should be between 1:4 and 1:16. When you enable Mixed Memory Mode in UEFI or you specify Mixed Memory Mode when building a CTO (configure-to-order) configuration (feature B52A), you will also be asked to specify the percentage of the DCPMM total capacity will be allocated to Memory Mode. The remaining DCPMM capacity will be allocated to App Direct Mode. The following tables shows the allowed percentage for each DCPMM part number and what the effective amount of App Direct persistent memory will be available to applications. Only a set number of percentages are available to choose from and the amount of App Direct persistent memory that is allocated will be in increments of 32 GB multiplied by the number of DCPMMs installed. The following table shows some of the supported combinations of DCPMMs and DIMMs. Additional combinations may be supported but the key requirement is ensuring that the ratio of the total memory DIMMs capacity to the total of the volatile (memory) portion of DCPMMs should be between 1:4 and 1:16. The following table lists which TruDDR4 DIMMs can be installed with DCPMMs. 2933 MHz DIMMs will operate at 2666 MHz with installed with DCPMMs. RDIMMs, LRDIMMs and 3DS RDIMMs cannot be mixed. Note: Some servers only support a subset of the above processors with DCPMMs due to thermal limitations. Consult the relevant server product guide for specifics. Intel Optane DC Persistent Memory is only supported in second generation Intel Xeon Scalable processors. 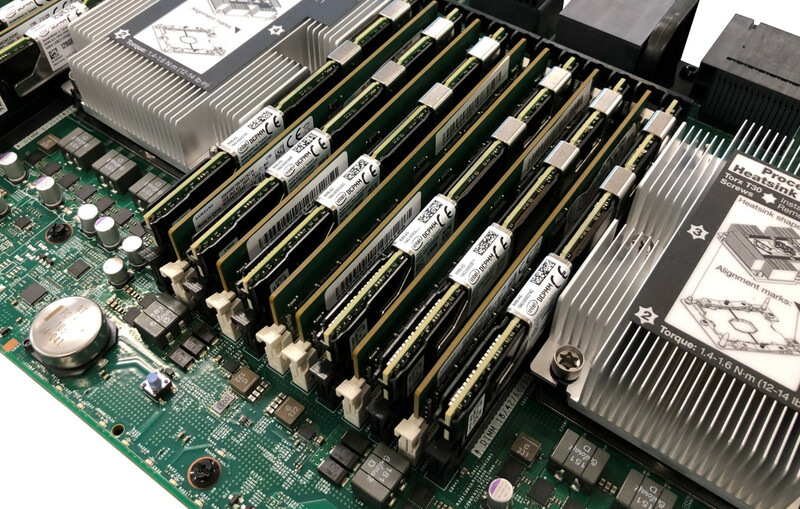 Most ThinkSystem servers have 12 DIMM slots per processor and 2 DIMMs per channel across all channels, thereby supporting 1 DCPMM in every memory channel. However, some servers have fewer slots, and as a result, not all combinations of DIMMs and DCPMMs are supported. When all 12 DIMMs are installed, this is referred to as a "2-2-2" configuration, where each 2 corresponds to the number of DIMMs per channel in 1 memory controller. When fewer DIMMs are installed, it is referred to a "2-2-1" or "2-1-1" or similar. The table shows with combinations are supported with each ThinkSystem server. 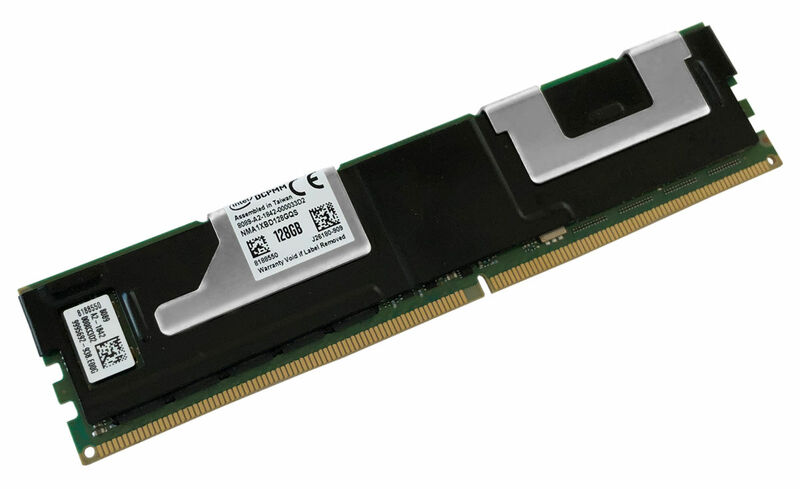 The ThinkSystem Intel Optane DC Persistent Memory Modules carry a 1-year limited warranty. When installed in a supported ThinkSystem server, the DCPMMs assume the server’s base warranty and any warranty upgrades. Intel®, Optane™, and Xeon® are trademarks or registered trademarks of Intel Corporation or its subsidiaries in the United States and other countries.